Captain Scott Pendlebury polled 169 votes to win his fourth Copeland Trophy at Crown Palladium. Scott Pendlebury marked his name alongside three of the club’s greatest ever players after winning his fourth E.W. Copeland Trophy in front of 1,500 guests at Crown Palladium tonight. The captain joined club legend Bob Rose as a four-time winner, with only Hall of Famers Len Thompson (5) and Nathan Buckley (6) taking home the honour on more occasions. The skilful midfielder polled 169 votes to win his third-consecutive best and fairest, 49 votes clear of Dane Swan (120). Collingwood’s younger players were rewarded for strong years with Jack Crisp (113) and Taylor Adams (103) finishing third and fourth respectively, while Steele Sidebottom polled a remarkable 102 votes to finish fifth despite missing six matches. The win further etches Pendlebury’s name into Magpie history, the 27-year-old is one of just three Norm Smith medallists, he’s the 46th player to captain the club and a member of Collingwood’s 15th premiership. 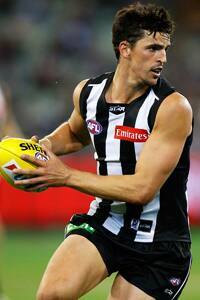 A player of great consistency and durability, Pendlebury polled in 19 of a possible 22 matches. He received a count-high 15 votes in the side’s Round 5 win over Carlton where he collected 32 disposals and kicked two goals, and in the nail-biting Round 14 loss to Hawthorn where he amassed a season-high 37 disposals. The skipper average 29 disposals and five tackles a match, both above his career averages, and topped the side’s stats table is total disposals (635) and total tackles (112). Season 2015 continued a dominant period for Pendlebury and Swan, with the pair finishing top three in six of the past eight E.W. Copeland Trophy counts. In a positive sign for the future of the club, five of the top ten place getters were aged 25 years or younger with Crisp, Adams, Tom Langdon and Marley Williams recording their highest vote tallies and Sidebottom again featuring heavily in the count. For the first time in five years, Travis Cloke was surpassed as the club’s leading goal kicker after Jamie Elliott secured the Gordon Coventry Award with 35 goals in 2015. And in a season where Nathan Buckley unearthed five debutants, Jordan De Goey took home the Harry Collier Trophy as the best first year player. The number five pick in the 2014 National Draft, De Goey played 16 games in his debut season, averaging 14 disposals and earning himself a Rising Star nomination in Round 20. Pendlebury has won the E.W. Copeland Trophy in 2011, 2013, 2014 and 2015.